9 − 8 = Required Please enter the correct value. After months of escalating trade fears, the White House hit the brakes on imposing sanctions on Chinese imports, signaling a potential thaw in international trade relations. 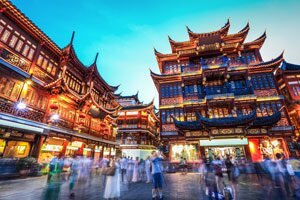 While Washington continues to flesh out the specifics of America's changing trade relationship with China, we're looking at the two best Chinese stocks to buy in order to take advantage of thawing Chinese trade relations. According to U.S. Treasury Secretary Steve Mnuchin, recent trade talks with the United States' largest trading partner were successful. "I think we've made meaningful progress," he said. "Now it's up to both of us to make sure that we can implement it." Fears of an all-out trade war drove Wall Street to sell off Chinese stocks at a furious pace. Between January and April, iShares China Large-Cap ETF (NYSE Arca: FXI) lost nearly 15% of its value. But now that investors are beginning to shake off their trade war fears, it's the perfect time to buy the best Chinese stocks. That's why we're giving you two of the best Chinese stocks to buy right now. Forbes recently reported that China has over 500 million middle-class consumers – nearly twice the entire population of the United States. And it's estimated that this population will surpass 600 million by 2022. A "Blueprint to Financial Freedom": America's No. 1 Pattern Trader used this secret to become a millionaire. Now he's sharing it live on camera – and you could learn how to set up a series of $822… $1,190… or $2,830 payouts… every single week. Because this demographic has a great deal of discretionary income, China's massive middle class turned the nation's retail industry into a $6 trillion-dollar industry in 2017. That a 400% increase from 2010 and a 900% increase from 2000. And analysts expect this exponential growth will only continue – especially online. In 2017, Chinese shoppers spent more than $1 trillion online for the first time in history. For context, the United States spend $455 billion – less than half as much as its leading trade partner. Chinese digital retail grew by 35% in the last three months of 2017. Currently, China accounts for 40% of global e-commerce. By 2020, that number is expected to grow to 60%. Our two favorite Chinese companies are perfectly positioned to take advantage of this explosive growth. In fact, our top company controls 50% of the Chinese online retail market. Best Chinese Stock to Buy, No. 1: Baidu Inc.
Based in Beijing, Baidu Inc. (Nasdaq: BIDU) is a multinational tech company that specializes in Internet services and AI development. In the simplest terms, the company is the Chinese equivalent of Alphabet Inc. (Nasdaq: GOOGL), Google's parent company. Baidu manages China's most popular web search engine and funds a multitude of app development and artificial intelligence projects. According to a report from the company's global business manager, Baidu currently has 800 million monthly active users and expects this base to expand by at least 15% in 2018. With its dominance as China's search engine firmly entrenched, the company has increasing turned to AI development to fuel its future growth. Recently, Baidu has developed AI tech that allows it to tailor search queries to a user's personal preferences. This tech has allowed Baidu to target its users with content from its app store and affiliated partners and increase the company's ability to generate profit. And it appears to already be paying off. Last quarter, Baidu named the company's AI developments as responsible for 31% of the company's revenue growth and a 9% expansion in operating margins. In addition to the improvements made to the company's AI platform, Baidu has seen a surge in third-party developers using its advertising platforms. In 2017, the number of third-party app users grew by 110%. Biaidu sees this figure growing by an additional 50% by the end of 2018. Figures like these are largely why the company beat earnings estimates by 70% in the first quarter of 2018. Thanks to Baidu's monolithic status as China's top search engine, Baidu is likely to dominate the nation's digital retail and information space for years to come. The company currently trades for $245. However, analysts see the company heading to a high of $331 over the next 12 months – a gain of 35%. While Baidu dominates the search engine market, our favorite Chinese stock is the king of the nation's retail sector. It's a stock that Money Morning Executive Editor Bill Patalon says is "one of those rare companies that is so well-positioned, that has such a great management team, and that has the benefit of serendipitous timing with a powerful, transformational trend" that even something as significant as a trade war can't slow it down.